"We belong!" That's what the apostle Paul is telling us. 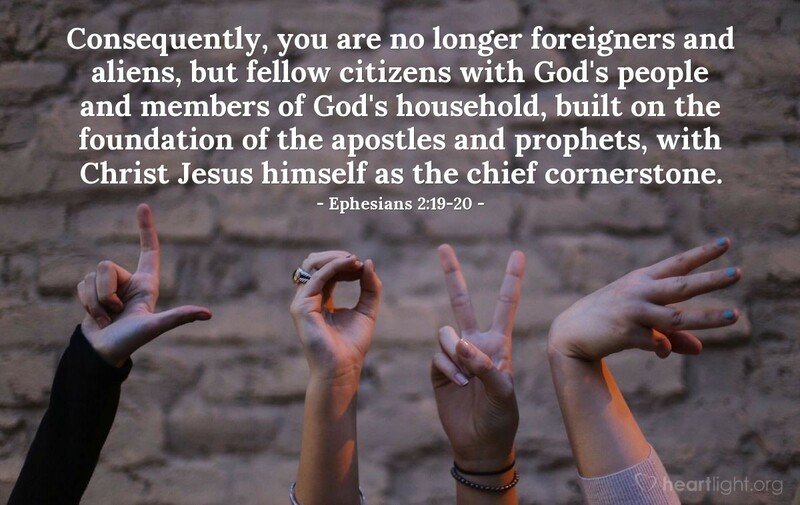 We're not outsiders or second class citizens or "Johnny come lately" children of God. Because of grace, we belong! We are part of God's house! The foundation of that house is made up of the apostles and prophets. The cornerstone of that house is Jesus himself. Incredibly, we are also a part of this holy house of God. We belong! El Shaddai, God of the mountains and LORD God Almighty, the covenant God of Israel, from age to age your steadfast love has blessed your people with your promises, your grace, and your future. Thank you for bringing me into your people by grace through faith in Jesus. Thank you for making me a vital part of your house. Forgive me for the times that I have doubted my importance to your cause and awaken in me the realization that I belong to you, to your people, and to your house. In Jesus' name. Amen.